For desktop administrators,a graphical user interface provides helpful display features such as windows, pull-down menus and scroll bars. But a tried-and-true command-line command can accomplish almost all of the same tasks -- sometimes more efficiently, especially if you're scripting. Windows 7 has myriad command-line scripts built into the operating system that you can use to shut down a user's computer, turn a firewall on or off, or force an update. Because they're so useful and there are so many, it's a good idea to start exploring some basic Windows 7 command prompts. 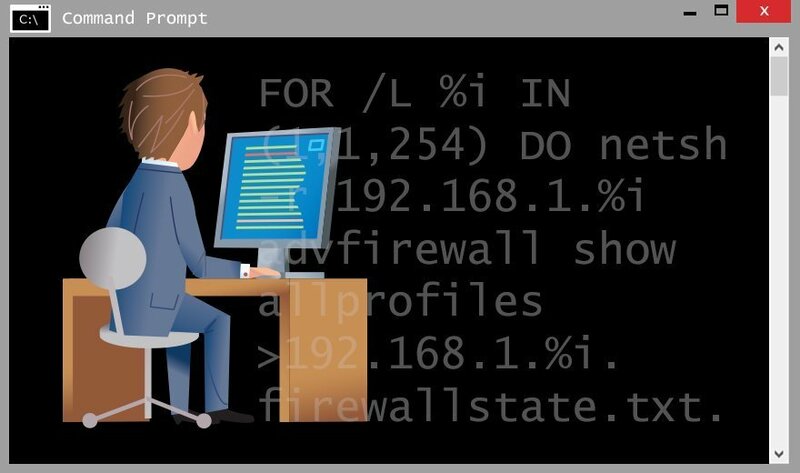 FOR /L %i IN (1,1,254) DO netsh -r 192.168.1.%i advfirewall show allprofiles >192.168.1.%i.firewallstate.txt. This will execute whatever command you need on multiple computers or IP addresses. In the example above, netsh is a place holder. You can put any switch you want in its place to execute across multiple computers. What is your most-used command?